Roll 37 at 52 rolls, more from Gwaii Haanas and surrounds. Lots of seascapes. I don’t think any of these have appeared at Burnt Embers yet, so you might want to follow the link over to 52Rolls to see most of the roll. It is beginning to feel like I might complete posts for 52 rolls before the end of the year after all. My backlog has about 8 more rolls, at least, and another is being processed this weekend, and then there are a few rolls in cameras, partly exposed. My summer Haida Gwaii trip aboard the Passing Cloud included several passes through the Juan Perez Sound area that lies at the center of the east coast of Gwaii Haanas. Over the past two decades I have spent many months in this area, walking the shores recording and testing archaeological sites. It is always a pleasure to return. 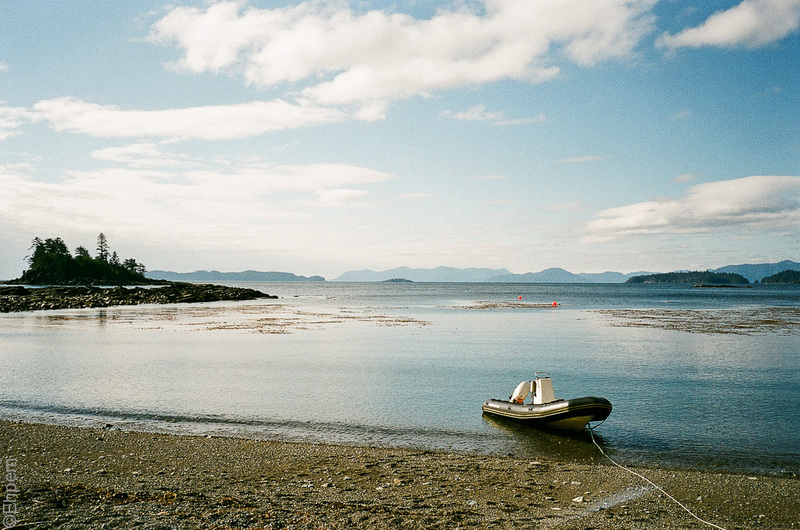 This roll includes images that start north of Gwaii Haanas at the Watchman site of K’uuna Llnagaay (Skedans) and then to T’aanu Llnagaay (Tanu) north of Juan Perez Sound on Tanu Island, then past Windy Bay along the east coast of Lyell Island and into the Sound including the Hotsprings area and then out of the NW corner of the Sound into another, Darwin Sound. The image captions in the gallery indicate the photo location. I can feel the quietness of this place – this must have been a fantastic experience for you. It is quiet, other than the sounds of nature like ravens. And ravens. But they are quieting to the spirit too, even when they are mocking visitors. The Haida cultural sites see a lot of traffic and are the least quiet places, but there are quite effective methods in place to preserve a contemplative and tranquil experience for visitors. Shore groups may not be larger than one dozen, and groups from different tours or boats are separated so that they have the places to themselves. It works quite well, and while you might pass another group on a trail, you don’t have to join a crowd. The concentrations of people are a bit inevitable as there are only a few of these sites, they are where everyone wants to visit and often is the reason they are in Gwaii Haanas, and at quite a few of them access ashore is limited either by exposed beaches with rough landings, or beaches that are not safely accessible during low tides. But, with the exception of Burnaby Narrows you can go ashore in most places without seeing another person ashore, and without seeing another boat for hours. It is still very remote and unspoiled.